There’s something wrong with CBS Radio’s (CBS) press release announcing the launch, complete with silly “countdown,” of 92.3 Now FM in New York City, a contemporary hit radio station that will replace K-Rock on Wednesday, March 11, at 5:00pm. (Contemporary hit radio, in plain English, means garbage pop songs, distinguished by their use of auto-tune and use of lowest-common-denominator song-writing.) CBS Radio Senior Vice-President of Something or Other, Don Bouloukos, is quoted in the release as saying, “Our assets in the country’s No. 1 market include among them the best known brands in the business. 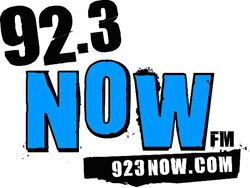 From the most listened to news and sports stations in the country, to the classic sounds of WCBS FM and the adult contemporary styling of Fresh 102.7, CBS RADIO offers something for everyone in the market – including young adults who are using the radio to discover today’s most popular music as featured on 92.3 NOW FM.” [Emphasis added, obviously.] And that, friends, is why the radio business, as we know it, is truly doomed. No, Mr. Bouloukos, young people are not turning on their radio to discover new music; they’re certainly not sticking around through the commercials to listen to new music on a radio station. No, sir, that’s what the Internet is for, and that’s why your business has no future. Some background information is needed here. For only one more day, 92.3 FM in New York City will be known as K-Rock, a typical rock station that you can find in any city in the U.S. If you can think of a rock song from the past 20 years, odds are, the station will play it. Twenty times per day. The latest ratings put the station at 21st place, one spot higher than a gospel station—there’s people who listen to gospel music in New York City?—and right behind a Univision-owned Latin Rhythm station. K-Rock, as a whole, isn’t doing too well. In fact, it’s doing so poorly that CBS Radio decided it was necessary to completely flip formats. Out with the Green Day and in with the Beyoncé! Opie and Anthony, a show I’ve enjoyed for several years now, was let go, according to Opie’s Twitter. It, apparently, doesn’t fit in with the station’s new direction. Fair enough, it’s for CBS Radio to decide if the show is relevant to the demographics it’s now targeting. You wanna know how I “discovered” Buraka Som Sistema, this ridiculous electronic group from Portugal? (Yes, I readily admit that my tastes in music are a little on the unusual side, at least by American standards.) On What.cd, a popular BitTorrent site, I was reading the profile of M.I.A., the girl who sings all those songs in Slumdog Millionaire. 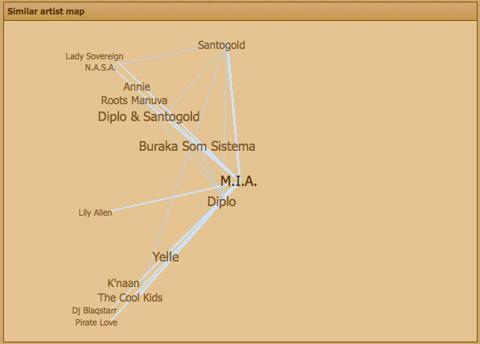 There’s a little related artists diagram, and one link leads to Buraka Som Sistem. I grab their latest album and say to myself, “holy smokes this is amazing.” (My favorite song of theirs happens to be “Yah! (The Count and Sinden Remix)”.) These guys are coming to New York in May, so barring some sort of catastrophe, I will be there and I will enjoy every last minute of it. Never mind that commercial radio in New York City will never play Buraka Som Sistem! Let’s try another example of how people discover new music in the year 2009. Opie, from the aforementioned Opie and Anthony show, had tweeted—there’s this thing called Twitter, CBS Radio, that I’m sure you’ll try to use before the year is out—a picture of a couple of CDs he had in his car. One of them was MGMT, an indie rock band that I had never heard of till then. Before you know it, hey, I’m now a fan of MGMT. What introduced me to this band? Nope, not crusty old commercial radio, but Twitter, a largely rubbish Web 2.0 site that, for all its faults, lets people talk nonsense rather effectively. One Tweet later, I now have another band to see when they swing by New York City. CBS Radio, that is how people are “discovering” new music in the year 2009. They’re not listening to the radio, sitting through commercials, waiting for the marble-mouthed DJ to say, “Hey, here’s [Cool New Band].” Yes, we know. We heard about [Cool New Band] two weeks ago via Twitter/Facebook/MySpace Music/whatever. Thanks for trying to remain relevant, though! Now, I still think radio, as a medium, isn’t dead yet. Plenty of people listen to talk radio, whether it’s of the comedy variety à la Opie and Anthony, of the political variety à la Hannity or Rush, or of the sports variety. (My God does sports radio delve into minutia!) Radio is great for news, too: nothing wrong with listening to the headlines while you’re stuck in traffic on the BQE. But this idea that CBS Radio, and others, cling to, that commercial music radio has a future, that people still seek out commercial radio to listen to new music, is laughably outdated.